We have updated information on road closures for this week and next that may impact you driving in and around the project area. Crews will work on the 28th St. bridge. Drivers will be detoured to use WB I-94, WB I-394, SB Hwy 100 and EB Hwy 62. Crews will work on the 28th St. bridge. Drivers will be detoured to use WB Hwy 62, NB Hwy 100, EB I-394 and EB I-94. Midtown Greenway between Nicollet Ave. and 5th Ave. S. closed Thu, April 18 from 6 a.m. to 2 p.m.
Crews will pour the I-35W bridge deck above the greenway. Greenway users should follow the posted detours. Crews will pouring the I-35W bridge deck above Lake St. 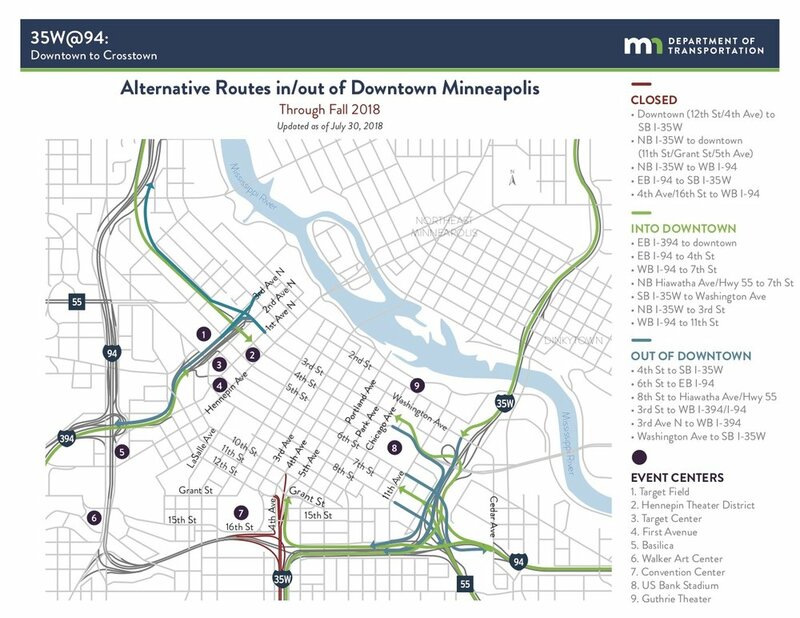 Drivers will be detoured to use Nicollet Ave., 31st St. and 3rd Ave. S.
We want to remind you that the NB I-35W access to 5th Ave. in downtown will close at 6 a.m. Mon, April 22 until September 2019. During the closure, drivers can still use NB I-35W to access 11th St./Grant St.
To learn more, including all current traffic impacts and detour routes, visit the project website at: mndot.gov/35w94. Metro Transit bus routes will be impacted as a result of construction. For updated route information, and to sign up for Rider Alerts, visit metrotransit.org/35W. Minnesota Valley Transit Authority routes will be impacted as a result of construction. For updated route information, visit mvta.com.